Recently my Safety Manager, Capt Herb Feller, asked if an aircraft carried out a Traffic Collision Avoidance System (TCAS) avoidance manoeuvre, and a loose drinks trolley ran down the aisle, what would be the force when it hit something or someone? As an engineer, it seemed obvious to me that this was an unanswerable question, but I suspect that most people will not understand why, so I will use this to illustrate the differences between energy and force. The assumptions provided by Herb were that the aircraft would pull up to a 10 degree pitch attitude and that the cabin might be 50ft long. The potential energy of an item relates only to the height, and the trolley at the top of the cabin is 50 x sin(10 deg) = 7.8ft higher than at the bottom of the sloping cabin floor. The problem with estimating the force at impact is that this entirely depends upon the deformation of the impacting surfaces. They don’t just hit, they bend and move. If the trolley hits a soft mattress, the force will be lower, but the deformation greater, than if it is stopped by a concrete wall. To stop the trolley we have to dissipate the energy, and this is transforming kinetic energy into heat energy, both in the trolley and the thing it hits. The product of the two (force x distance) is the energy being dissipated and this is the same as the potential energy that we started with. Another problem is that people are not familiar with force units, as a pound force is not the same as a pound mass, so using the imperial units that Americans are familiar with, we get (I kid you not) “slug feet per second squared”. The metric units are “kilogram meters per second squared” or Newtons. This is why my answer to the original question was that the force is the same as if the trolley had dropped 7.8 ft onto your toe. This isn’t a statement about the force, but about how you can imagine how much it would hurt! 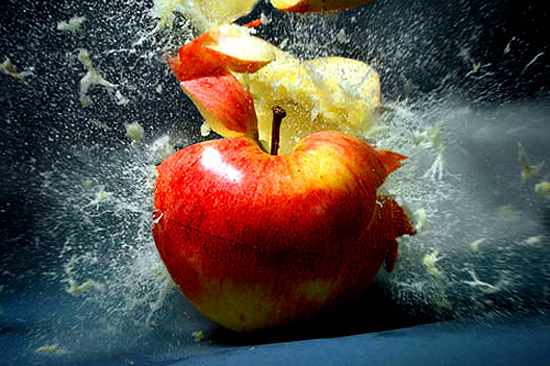 Handily, all schoolboys in England know that a Newton force is about the same as the weight (the force on your hand when opposing gravitational attraction) of an apple.